We recently designed a new website for LaserCycle USA of Louisville, Colo., a provider of integrated, sustainable document solutions including digital printing and copying technology. “This beautiful site serves as an important resource on LaserCycle USA’s commitment to sustainability,” said David Heitman, The Creative Alliance’s president and creative director. 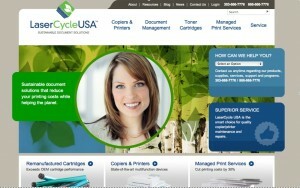 LaserCycle USA is one of the nation’s largest producers of recycled, remanufactured laser toner cartridges. The website can be viewed at www.LaserCycleUSA.com.